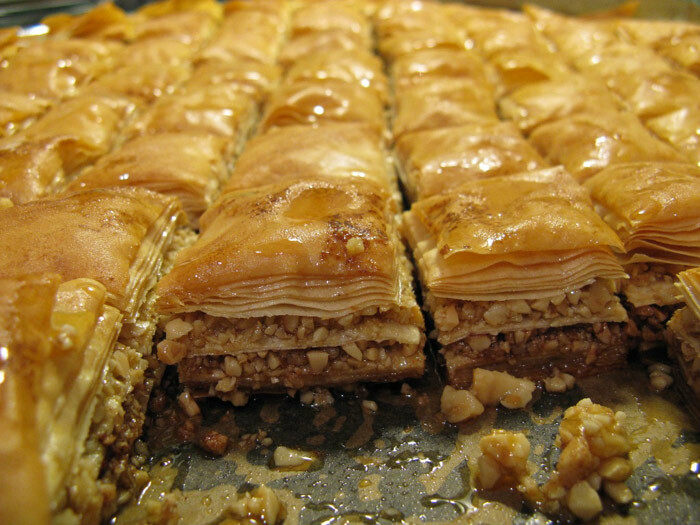 Here’s an easy recipe for mouth-watering baklava! Once boiling allow it to simmer and thicken. It will thicken more once cool. Remove the cinnamon sticks and cloves once at room temp. Combine the walnuts, sugar, cinnamon and mix well. Melt your butter. Grease the inside of the tapsi using your butter brush. Cover the bottom with 2 layers of phyllo pastry. Be sure to butter each well, then cover the bottom and each side allowing the pasty to hang over (Use four sheets, one for each side). Layer over the bottom a third of the walnut mixture then drizzle butter over the top of that. Place in the next layer of phyllo and crumple this layer to allow air pockets. This makes it light when it is finished. Next cover the entire layer with drizzled butter. Now layer another third of the walnuts and again drizzle with butter. Repeat with scrunched phyllo and more butter. Be generous . The last stage is to fold over the sheets you laid over the side when you started, overlapping them and cover each with butter. Allow six smooth layers of phyllo to finish off, buttering each as you lay it. It is best to score your cuts into the top at this stage but do not cut all the way through. You can either bring it to me at the bakery and I will cook it or if you wish to do it at home set the oven to 325 and bake for 45 minute. Then raise the temperature to 350 and bake till golden brown -15 to 30 minutes depending on your oven. If it cooks longer than this you may find it a little dry . As soon as the baklava is done you should pull it out of the oven and pour the (room temperature) syrup evenly over the top. The reason the syrup is at room temperature is because it will absorb better into the baklava. Let the baklava set for at least 4 hours, then cut and enjoy. Can you give me Fillipo’s Bakery hours as I am not sure what time I will get to his shop with my Baklava for cooking. You just can’t trust these airline timetables anymore!! This sounds wonderful and will definitely try it!! What a good man for helping and I am sure the poor children would not have tasted anything like this if they have some. Another Novella, can’t wait you are really on a roll . I will be patient. No pressure! Love reading The Greek Newsletter. Thanks for that. I’m in Poros on holiday!